Dubai, UAE, April 11, 2018: Thinking big is most effective when it's matched with making it big in an elegant manner. A 47 mm case, with increased aperture, and an iconic stop-start trigger show that the Chronofighter Grand Vintage means business. Military aviation history from the 1940s has reached new heights in this striking quartet of confidently contemporary timepieces. They are time capsules that connect yesterday to today, with refinement and simplicity born of expertise. Watch out for them on the wrists of stylish connoisseurs with a glass of Grand Vintage malt whisky in their hand, or co-piloting sporty free spirits. The trigger on the left-hand side of the case acts as a symbolic bridge between nostalgia and modernity. Originally placed there for easy thumb-activated operation in the cockpit, it now facilitates smooth operation of the chronograph on the ground, stationary and at speed. A pristine shirt-sleeve may have taken the place of the cuff of a beloved leather flying jacket in the meantime, but the fast-action kick remains. The Graham Chronofighter Grand Vintage models have their eye to detail. A domed sapphire glass integrates a magnifier for the date at nine o'clock. After all, time flies in today's world too. The case's large aperture serves to enhance legibility of the chronograph dial, as well as adding an additional active signature. For good visibility, regardless of weather conditions, the case back comprises a see-through sapphire crystal. Just to be sure that solar power can be put to aesthetic use, a steel satin-brushed bezel and sunbrushed dial with a radial gradient are ready to catch the rays. Four new members of the established Graham Chronofighter family are joining the ranks under the Grand Vintage label. 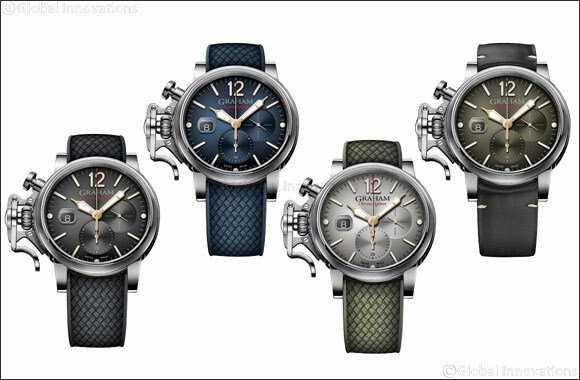 Nostalgic inspiration gets an up-to-the-minute interpretation with dials in blue, brown, silver or black. Sporty rubber straps, in black or green, with a distinctive Milanese-style mesh pattern, are feisty newcomers to the family. A calf leather variant in blue is geared to those wishing to confidently cling on to a classic. Making things happen is a Swiss G1747 automatic chronograph movement with an Incabloc shock absorber and power reserve of 48 hours. And while the air remains the creative force, water resistance to 10 bar (100 meters) is always on board. Downsizing just lost its appeal; standing out from the crowd never will.